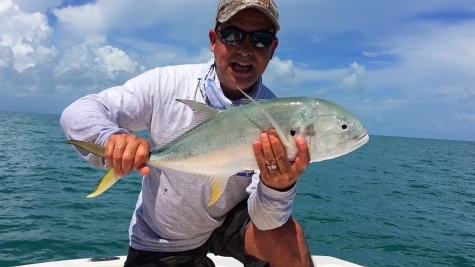 Bullbuster Community Everglades & Southern Gulf Of Mexico Master! 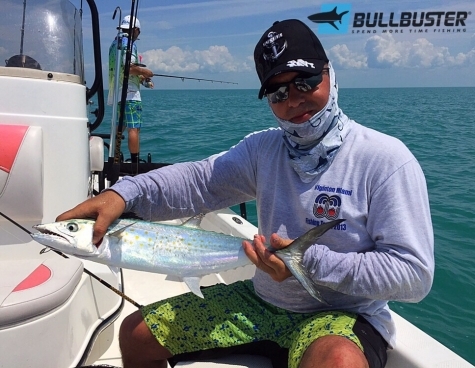 #BullbusterAmbassador Albert Acosta has been very active in the Bullbuster Community over the past year. 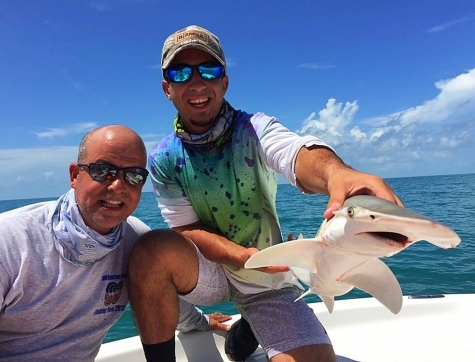 In this time he has had many successful fishing trips to the everglades fishing not only in the back country buy venturing out into the Gulf Of Mexico to fish local wrecks. In these trips he has caught, snook, sea trout, tarpon, permit, cobia , sharks, Goliath grouper, and more! 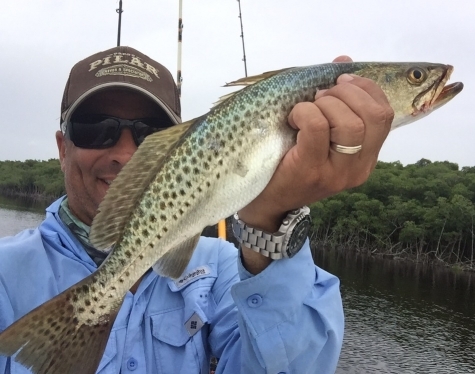 In this article you will find a number of reports posted by Albert as well as tips and tricks from Albert and the web on how to be successful while salt water fishing in the glades. The video below shows Albert's go to rod and reel setups, what Lb test lines he uses, as well as his go to lures for the backcountry. After watching this video scroll down to read his many reports to see that his advice comes from hundreds of hours on the water landing just about every species the everglades has to offer. When I fish the Florida Keys or backcountry Everglades national Park I primarily use a five rod and reel set up. I use Quantum Boca and Cabo 40s loaded with 30 pound Bullbuster braid. This will be ideal to target multiple species of fish like snook, redfish, trout, Spanish mackerel, Cobia, Trippletail, and small sharks. I have three of these set up with different lures or jigs ready to go at a moments notice. I primarily use on these three rod and reel set ups Bullbuster 30 to 40 pound florocarbon fishing line . From here we move up to my heavier gear which will be the Penn spin fisher 7500 loaded with 50 pound Bullbuster fishing line and I primarily use 50-80 pound flourocarbon on this set up. I will use this for large cobia, big permit, and big sharks or tarpon. Then my heaviest gear set up is my Penn International 16 VS loaded with 100 pound Bullbuster mono. I use this set up for Goliath grouper and big sharks. This set up does not mess around strong reel, strong rod and very strong fishing line. Not to many fish escape it's clutches. From here we will go to my favorite lures, jigs and tackle for the backcountry. These favorite lures and tackle are my go to that I use to target all types of fish in the backcountry. Below are a few of Albert's go to lures for fishing the back country. I got my wife and little son ready and out we went for a day of fishing in Everglades National Park. It was a beautiful morning heading out to the fishing spots and I could not wait to start throwing the lines in the water. Once we arrived at the spot the water was beautiful and calm with the tide still flowing out to the Gulf. We had live shrimp that we had picked up nice and early and we were ready for some fishing action. I had my Quantum Cabo's loaded with Bullbuster 30 lb Braid with 40 lb flourocarbon with a Monster 3X artificial shrimp and 1/2 jig head. We settled down in a spot and started throwing out baits and lures. It was not long before we were getting hits on the live shrimp and lures....nice seatrout. The seatrout were hitting everything we were throwin into the water. We were catching trout almost on every cast and they were getting bigger. We were catching some real nice trout and my son Alex was on as well. He landed his trout and we started filling up the fish box. We love seatrout they are a very tasty fish and these trout were nice and fat. I started using the artificial shrimp and started catching bigger seatrout....they loved that big artificial shrimp. I kept throwing that big shrimp knowing there were other fish in the area ....and I was right! A big hard hit and long run....I knew what it was....it was a big snook. I fought the fish and she was fighting heard making some nice runs and head thrashing on the surface, I worked her closer to the boat praying that the Bullbuster 40lb floro would hold....and it did! I got her close and screamed for my son to net that big snook...and he did great! Snook was landed aboard the Epic Tails....she rewarded us for not cheating on her at the boat show....she's a great boat and she catches fish...we are together forever! My name is Albert...and I'm a addict... a fishing addict! Yes I am ... they say the first step is to admit it... well there I admitted it... I love fishing... if I could I would fish every day. 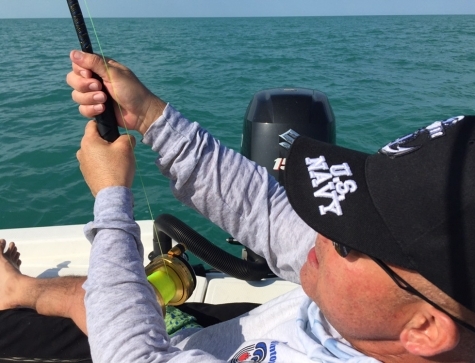 🎣🐟😁 The last few weeks I've been heading out to the beautiful waters of the Gulf of Mexico where the fishing in the summer is awesome...so this weekend would not be any different. Smooth As GlassThere's something about the warm scenic waters of the Gulf that calls me out there it like a magnetic attraction... but that's enough let's get to the fishing! 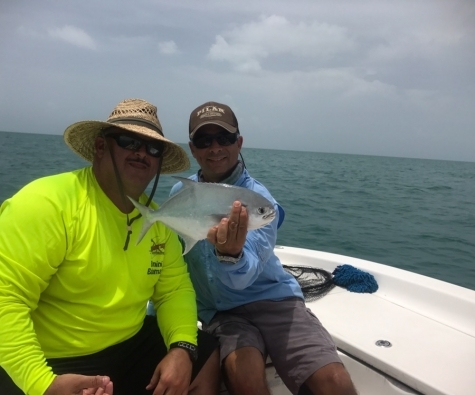 Good friends Mike and Jorge were ready for some action but the day started out rough with the bait store being out of live shrimp, both bait stores! I love using live shrimp out there... every thing out there eats shrimp. So we decided on getting a few dozen live pinfish and headed out. The ride out to our spots was smooth as glass and we couldn't wait to throw some baits in the water. It would not take long as we were working a beautiful bank with some great structure. There were logs and tree parts all over this area... great snook and redfish habitat as the tide was rolling out. 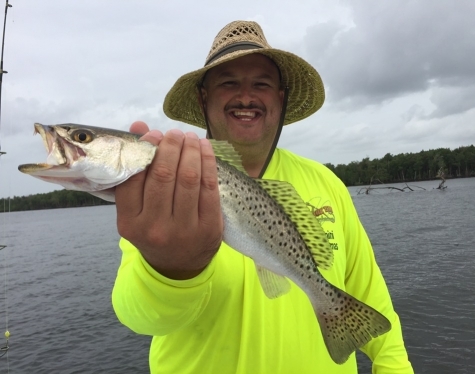 Jorge was casting towards the bank and as he brought his jig in with a Gulp shrimp we saw a big swirl around his jig and then the drag screaming! 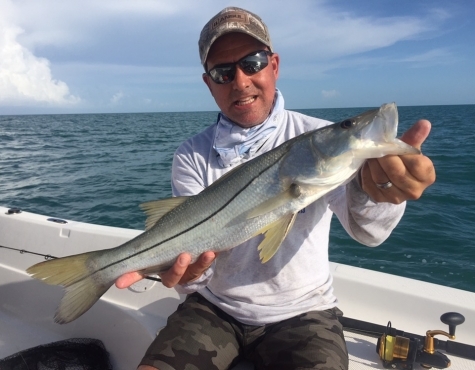 Jorge was on to a nice snook and it was hell bent on getting away and made a dash for the shore loaded with logs! But it was not going to happen... Jorge put the breaks on that snook and worked him close to the boat. I grabbed the net and we scooped up the snook... it was a beauty! After a few picks we placed the snook in the water and watched him swim away...not a bad way to start the morning! We kept working the shore looking for fish and we could see a few wakes swimming towards us... we were not sure what they were but we made our casts at the approaching fish. Within seconds our reels were screaming and line ripping out. 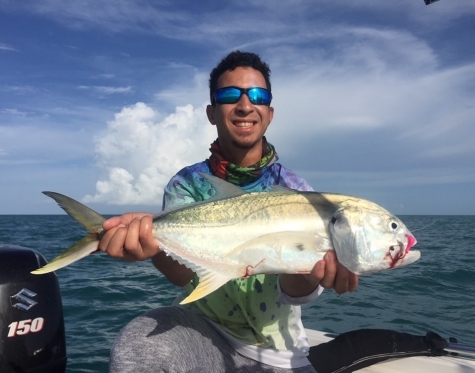 Jorge and I were on....two big jack crevalle. We fought them for a while with both fish making some nice runs. The Bullbuster Fluorocarbonwas holding strong and we landed both fish. They were beautiful strong fish. After a quick pic we let the Jack Wonder Twins go and they swam off into the dark water. We kept fishing and as I reeled in my jig with swimming shad... BOOM a nasty hit right next to boat! What was this... I wasn't sure but it made a nice run. 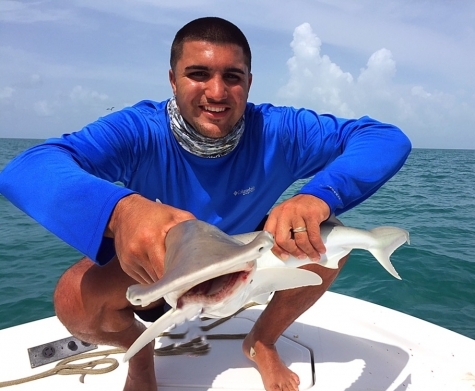 I fought the fish for about 10 min and was getting it close.... then we saw him... a nice lemon shark! 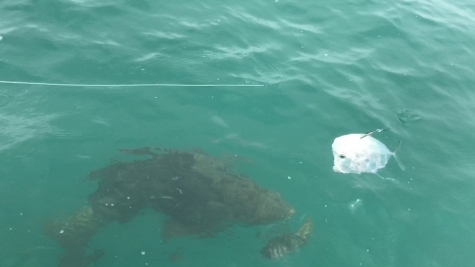 The lemon shark hit a swimming shad type soft body! The Hammerhead swam off and we were pumped! It was truly magnificent fish. 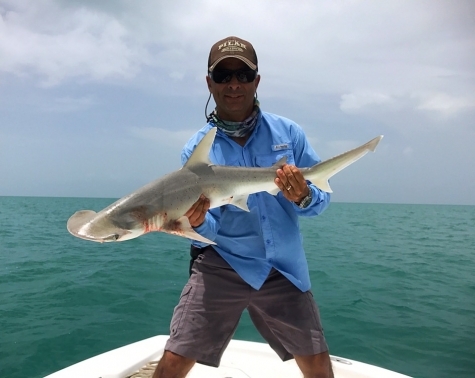 We kept fishing a few more spots and caught some more jacks, runners and bonnetthead sharks. 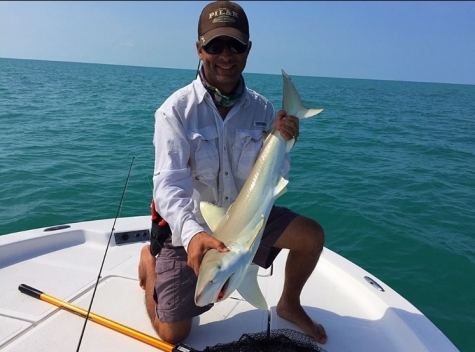 We had some nice action and Jorge finished off the day with a backcountry baby Bullshark. Baby Bull SharkThe day was coming to an end and we headed back to the marina. We had a great day and caught some nice fish! I hope you enjoyed my article and it helps you catch more fish! Remember order your fishing lines at Bullbuster.net. Fast delivery! 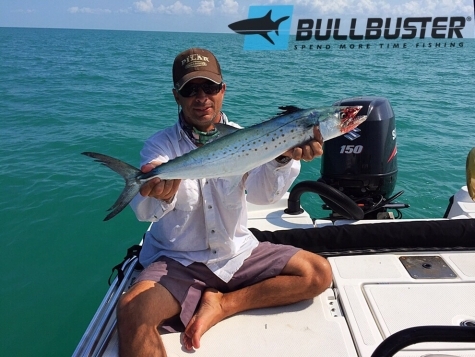 Bullbuster helps you spend more time fishing! 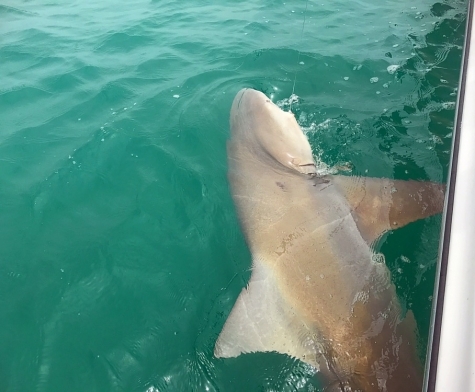 As he got closer I could see how big he truly was... he was a beast bull shark and we caught him! Here is link to short video clip of us landing him and giving him a good pat on the back before releasing him. 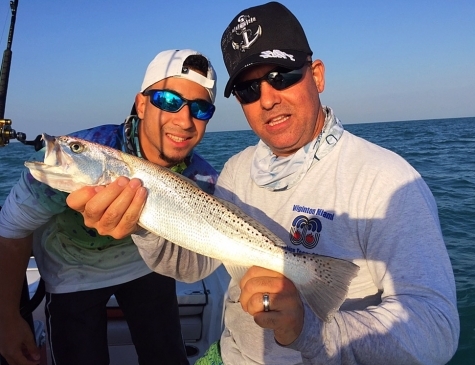 The weekend was getting near and I called my buddy Ruben and his son Ryan and told them it was time to head out to the Gulf of Mexico. I had a feeling the cobia, permit snook, sharks and Goliath grouper would be on fire this weekend...it was hot and the weather was going to be nice. The night before I prepared all my rods, reels and gear ready for the next days adventure. I loaded the Bullbuster floro on all the reels. 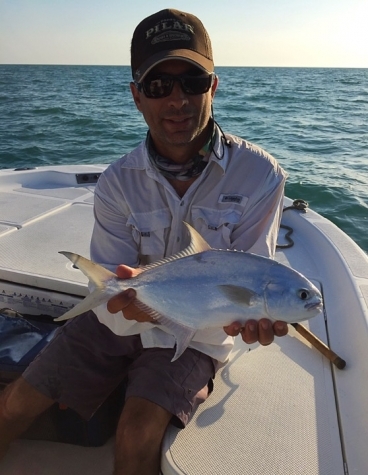 I use 40 pound Bullbuster florocarbon for the big cobias and permit. It helps prevent break offs when you hook up to a big one! 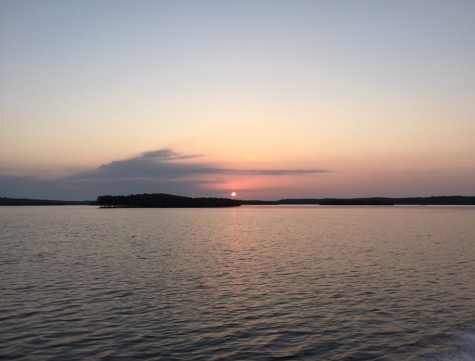 We headed out nice and early before 4 a.m. and picked up the bait and headed out to the fishing grounds it was a beautiful day and it was really hot. 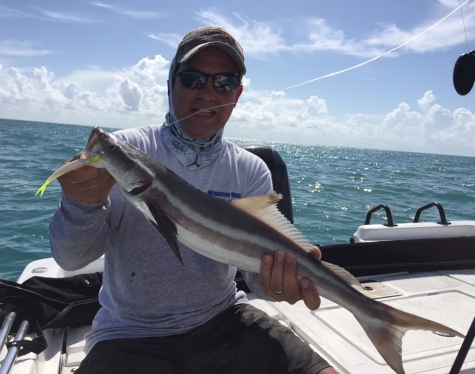 Once we arrived at the fishing grounds we scouted out the area looking for cobia and permit...it didn't take long, Ruben made a cast and on the first hit he had a nice snook! He caught the snook on a live pinfish.... snook love pinfish! Pinfish on a small jig or free lined are deadly for snook and many other species of fish. Most fish would find it impossible to pass up eating one. We kept moving around fishing different areas until we finally found some cobia. The Cobia were going around the boat, they were looking for bait fish and anything else that was swimming in the water. 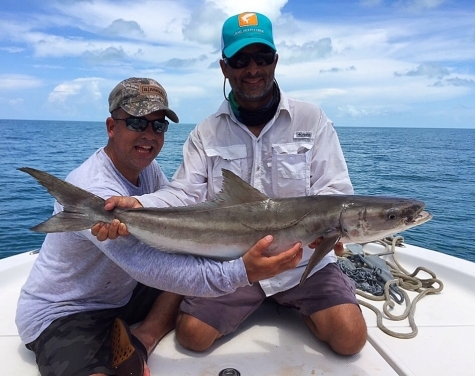 We made a couple of casts and we were on to some nice cobia! Ruben saw some cobia and made a cast... he was on! 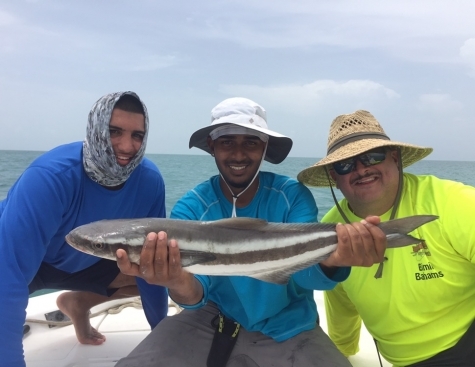 The best part of Ruben's cobia was that he caught it on an artificial swimming shad... it was awesome he made the cast the Cobia chased it down furiously and enhaled it! Cobia are aggressive feeders and will hit almost anything you throw at them. 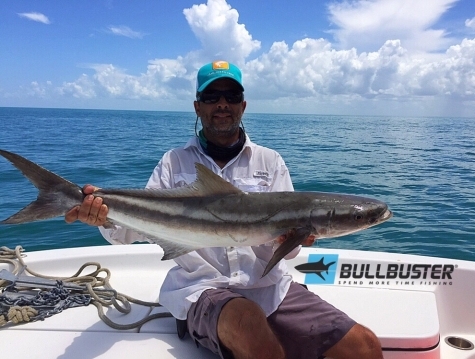 This was Rubens first cobia and he was one happy guy! 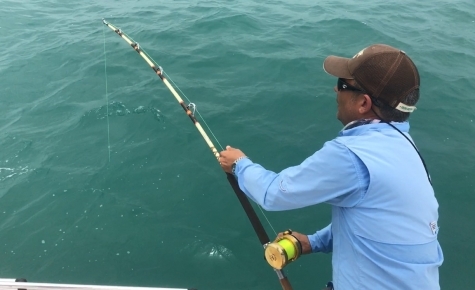 🤗🎣🐟 after Ruben landed the Cobia we had furious nonstop action that morning all the way to the early afternoon, it was fish after fish...Cobia, sharks, jack crevalle, blue runners, and Goliath Grouper. 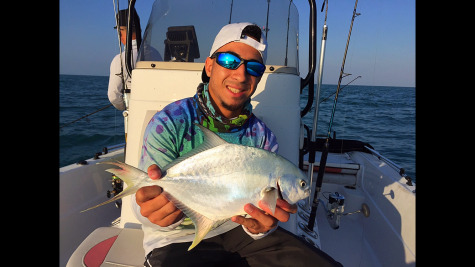 Ruben and son Ryan hooked up to a nice jack crevalle...they made a nice hard runs and Ryan and Ruben fought the fish for a while and brought them to the boat and we got him them both into the net! They were beautiful jack crevalle and they are one of the hardest fighting fish you can mess with! The fishing was intense for the rest of the day. 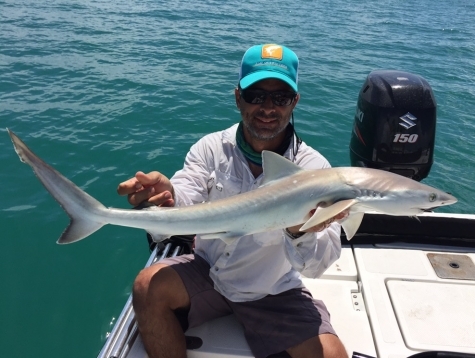 We also had serous swarms of sharks bonnettheads, lemons, and sharpnose sharks attacking our baits. I decided to do some drifts and soak some dead baits in the water and before you know it in a few minutes I was on!!! A powerful run... I could see the big Cobia hit the bait and jump out of the water! I was in a tough battle but luckily I was using my heavy Penn Spinfisher 7500 loaded with Bullbuster 50 pound braid with 40 pound floro.... this cobia was in major trouble....he messed with the wrong set up. All I had to do was land this fish before a big bull shark or hammerhead shark swallowed my cobia...It was a race against time! After about a 10 to 15 minute fight we got him to the boat and Ruben gaffed it perfectly! We had him...a beautiful hard fighting delicious cobia! We were going to eat good that night! It was a great day and the fishing was non stop! We could not have asked for anything more. Great friends and great fishing.... almost forgot... and great dinner! I hope you enjoyed my article and this helps you catch more fish! 🎣🐟🐟🐟 Remember spend more time fishing and order your fishing lines at Bullbuster.net. Fast delivery! I use Bullbuster Braid, mono, and fluorocarbon and I can tell you one thing, their fishing line is strong and it will help you land more big fish! Take care! P.S. Stay tuned for article on how I cook my cobia! One of my favorite fish to eat!